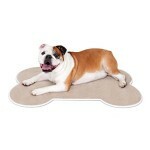 Help your dog sleep and relax like a dog with this super-soft and ultra-cushioned mat. 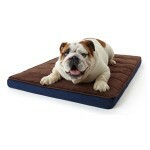 A ½” of memory foam provides contoured support and also helps retain your best friend’s body warmth to enhance coziness. 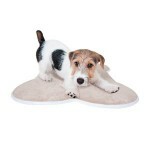 The quick-wicking Microdry fabric top helps keep the mat bone dry even when your dog settles in after a rainy day walk. 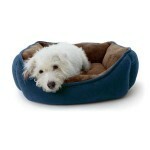 If your dog likes to nest or burrow, this is the right bed! The over-stuffed sides and floor cradle your buddy in warm and cozy comfort. The Microdry fabric is super-soft to the paws and amazingly tough against both claws and jaws. A skid-resistant backing keeps the bed in place even if your pup is chasing squirrels in his or her dreams. Adorable, durable, portable and incredibly comfortable, this hound house is sure to inspire plenty of tail wagging in your house. The soft padded walls and roof are easy to assemble and provide cozy shelter. Inside, a machine-washable memory-foam cushioned pad protects against hard floors and ground. The house folds down flat for easy storage or transportation between rooms or homes. 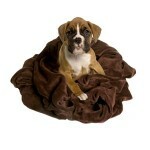 Treat your pet to the nap of luxury with a super-soft blanket that’s lightweight yet warm. The lush Microdry pile stands up to pre-sleep bed-clawing and resists pilling. 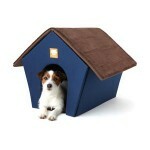 Provide big comfort for your big dog. This spacious sleeping habitat offers supremely thick cushioning and a super-soft Microdry-topped cover for incredible comfort. The slip-resistant base keeps the bed where you want it and the cover is removable for machine washing and drying.